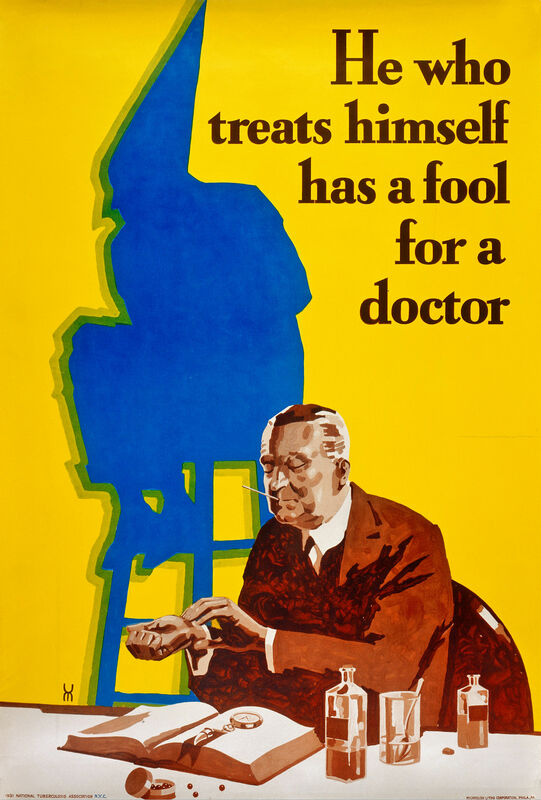 "'He who treats himself has a fool for a doctor.' A man takes his own pulse at the wrist and has a thermometer in his mouth. On the table before him are an open medical book, a fobwatch for taking the pulse, a pillbox and some medicine bottles. On the wall behind him is projected the shadow of a fool (wearing a dunce's cap) sitting on a stool. Bears monogram, possibly "CE" with C reversed, assumed to be initials of artist; could possibly be EC, MU or UM." From 1931.